Preheat the grill. Cut 2 thick slices from a crusty white loaf and toast on one side. Divide a 155g can Glenryck South Atlantic Pilchards in Tomato Sauce between the 2 slices of toast, spread on the untoasted side of the bread, and place 4 slices of tomato on each. 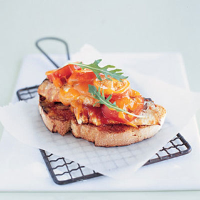 Divide 25g grated or sliced Red Leicester cheese between them and place over the tomato. Grill until the cheese is bubbling. Serve immediately with Tabasco Sauce sprinkled on top for a hit of spice, and garnished with rocket leaves.